WMAP First-year Paper Figures,N.Jarosik, et al. 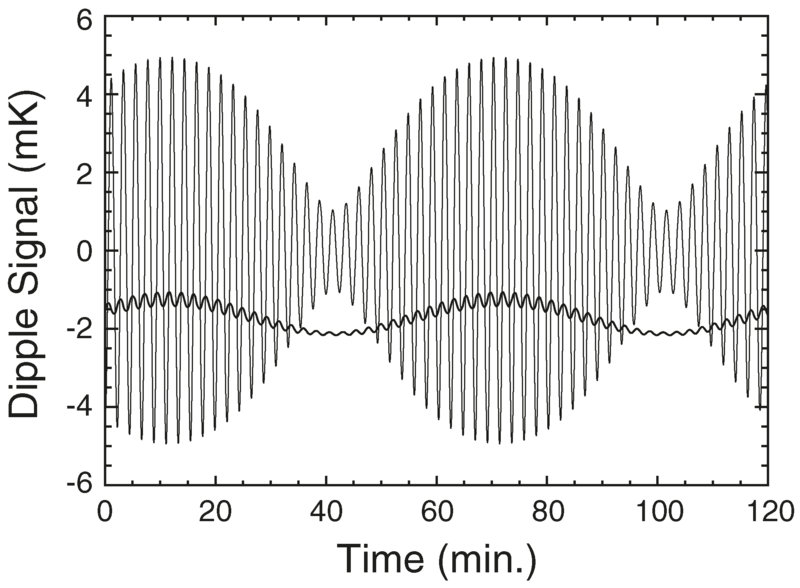 Frequency response of the WMAP data collection system and some representative input spectra. The curve labeled ‘‘AEU filter’’ (dot-dashed line) is the amplitude response of the two-pole Bessel filter (ƒ3dB = 100 Hz) before the voltage-to-frequency converter in the Analog Electronics Unit. The four solid lines labeled ‘‘Integrator’’ are the absolute values of the sinc functions corresponding to the 128, 102.4, 76.8, and 51.2 ms integration periods used for the different radiometer frequency bands. (See Fig. 8 of Bennett et al. 2003b.) 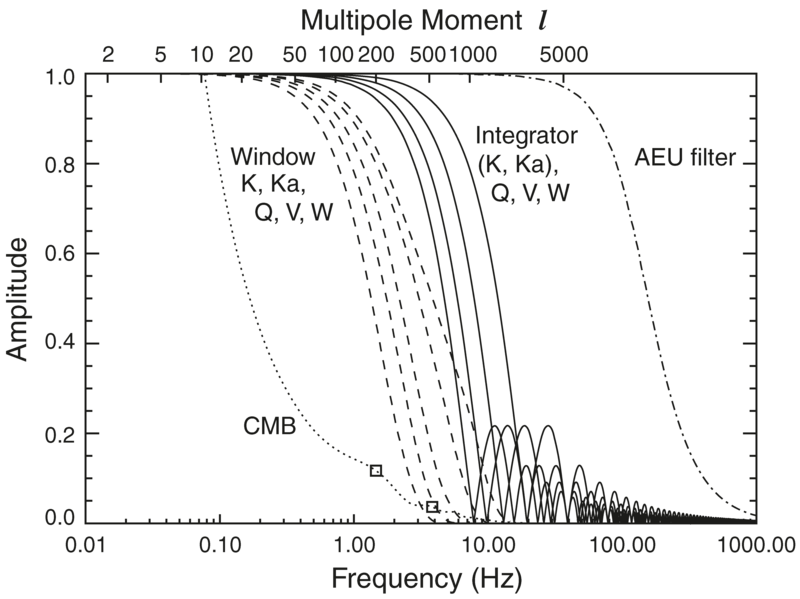 The dashed lines labeled ‘‘Window’’ are the frequency spectra that would result from WMAP’s scan pattern and beams if it were observing a scale invariant angular power spectrum (Cl = const.) sky based on the window functions in Page et al. (2003a). The dotted line labeled ‘‘CMB’’ is the input signal to the data collection system that would occur for a typical CMB sky sampled by an ideal pencil beam. The two squares on this last curve show the approximate locations of the first two peaks in the CMB power spectrum. The response of the AEU filter is down from unity by 0.1% at l = 1000, indicating that it has a negligible effect on the shape of the observed power spectra. 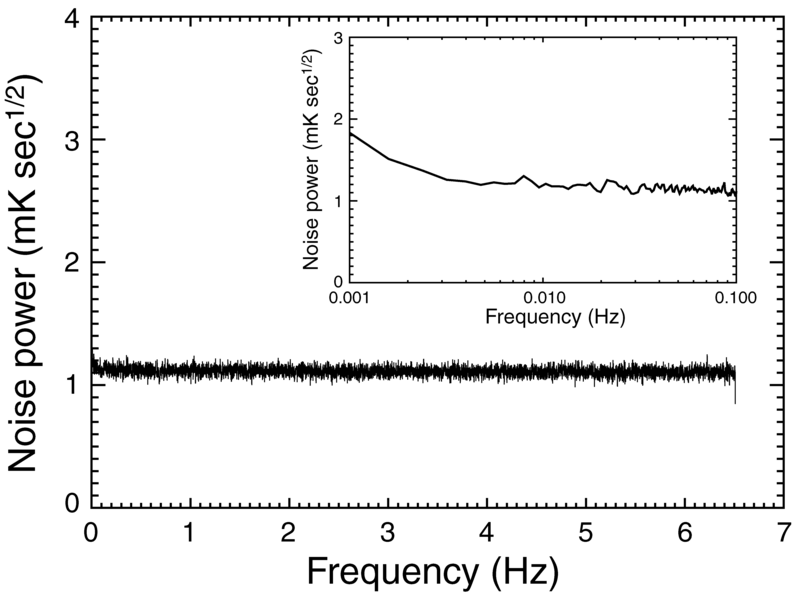 Noise power spectral density of the V12 radiometer obtained from 3 days of on-orbit data. Sky signals arising from the dipole, CMB, Galaxy, and point sources have been removed. The inset contains an expanded view of the low-frequency region of the same data. The flat spectrum down to very low frequencies ( ƒknee = 1.41 mHz) indicates proper radiometer performance. 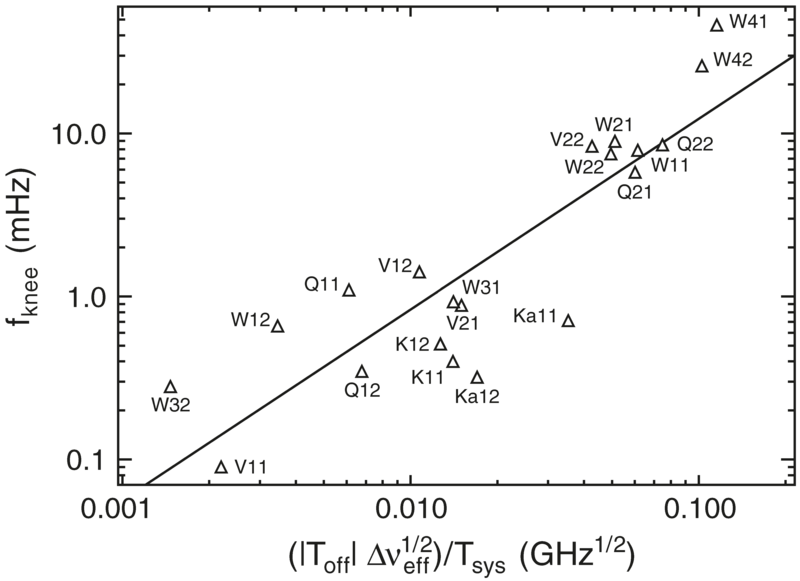 Dependence of ƒknee on Toff for the 20 radiometers comprising WMAP. The solid line is a power-law fit to the data of the form ƒknee ∝ [(|Toff|Δνeff½)/Tsys]2/α with α = 1.70. The scaling of ƒknee with Toff indicates that ƒknee is largely determined by radiometer gain fluctuations modulating the signal from the radiometer offsets, as expected. Predicted differential (thin line) and common-mode (thick line) CMB dipole signal for a typical 2 hr period of WMAP observations. 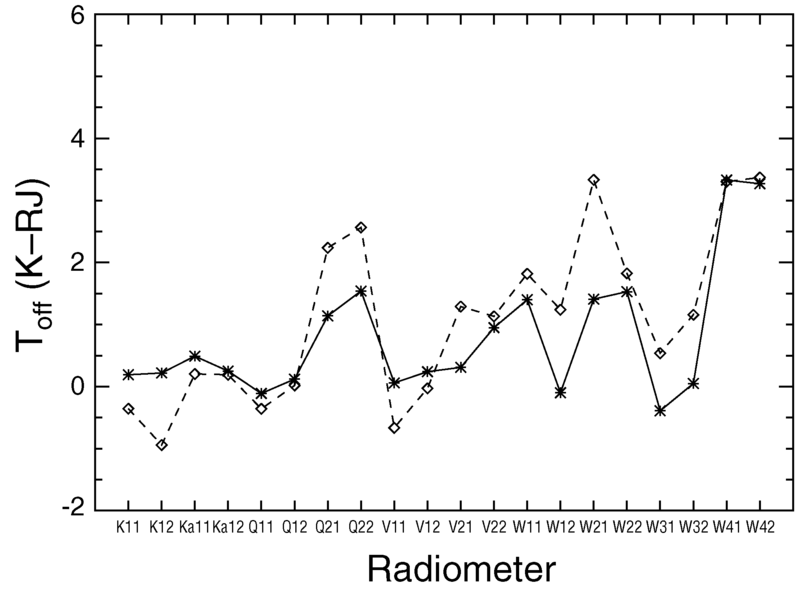 The rapid period (≈2 minute) corresponds to WMAP’s spin rate and the slower period (1 hr) to the precession rate. Measurement of the common-mode signal component in a radiometer’s output allows characterization of the nonideal (common-mode) radiometric response. 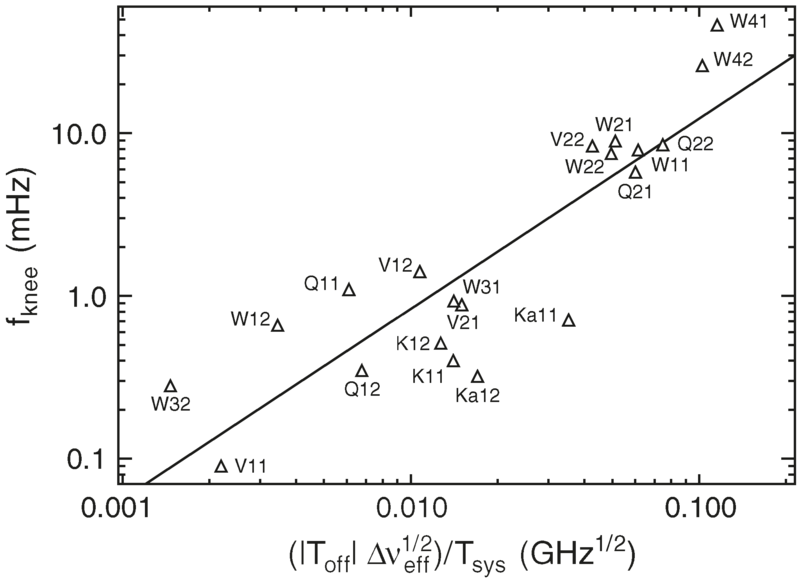 On-orbit measurements of the radiometer offset temperatures, Toff (stars), and predicted contributions to the offset temperature, ΔToff (diamonds), for all 20 WMAP radiometers. Values of ΔToff are obtained from measurements of the radiometer common-mode responses to the CMB dipole signal. 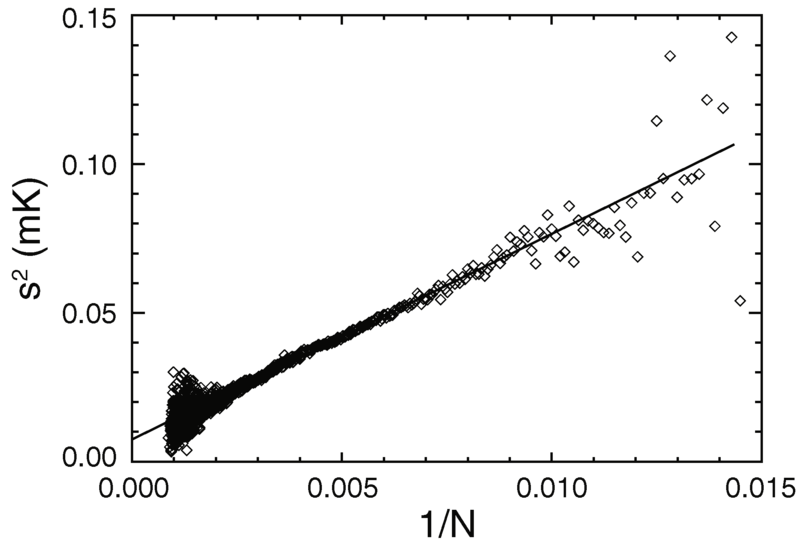 Significant correlation between the measured offset and the predicted values of ΔToff are expected and observed. The lines are drawn to aid in seeing the correlation. Distribution of the prewhitened V12 radiometer noise obtained from 10 days of observations. Sky signals arising from the dipole, CMB, and Galaxy have been removed. Data points were cut when either radiometer beam encountered a planet or a region of high Galactic emission. 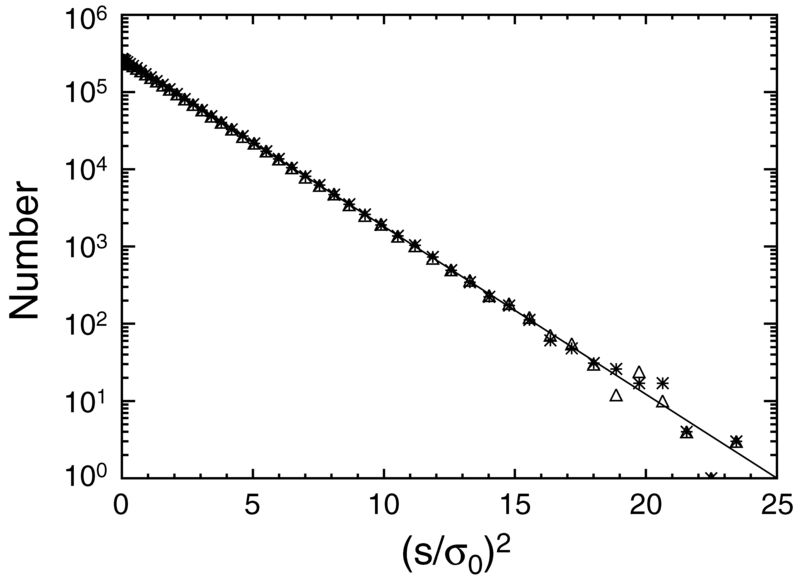 The line corresponds to a unit variance Gaussian distribution normalized to the observed frequency at s = 0. The two symbols denote the values obtained from the two sides of the distribution. The highly Gaussian distribution indicates that the noise variance for each pixel of the resulting sky maps should scale inversely with the number of observations of that pixel. 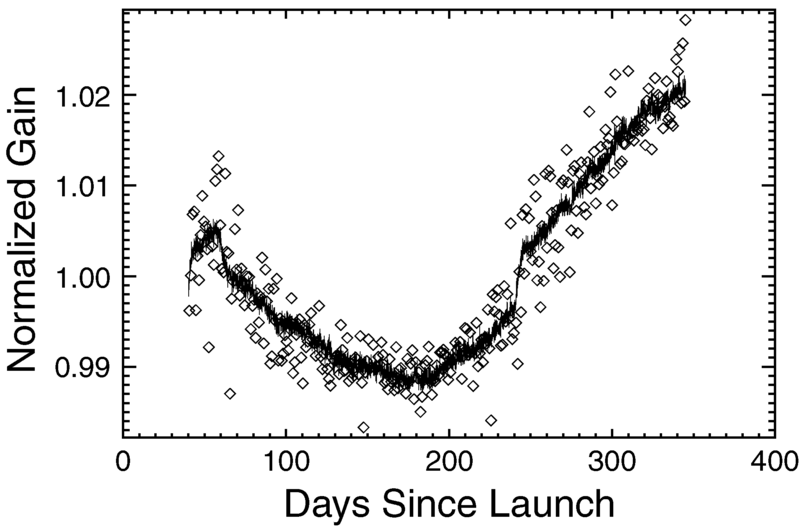 Measured sample variance, s2, dependence on normalized number of observations, Nobs, for the V1 sky map. The diamonds are the sample variances measured from each subset of map elements for which N - 0.5 < Nobs < N + 0.5. The solid line is a linear fit to the data. As expected, the noise variance scales as N obs, confirming that it is a good predictor of the pixel noise. Comparison of the V11 radiometer gains measured from the CMB dipole (diamonds) and the gain model (solid line). The CMB derived gains are 24 hr averages. 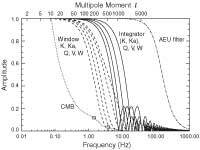 The high-frequency noise in the gain model arises from the quantization of the RF bias housekeeping data. The rapid gain change ≈245 days after launch is the result of a small (0.5 K) change of the RXB temperature as a consequence of an adjustment of the spacecraft’s main bus voltage. Note the entire vertical scale spans a ≈4% range. The model clearly tracks the measured gain values well and is therefore useful in smoothing and interpolating the hourly gain measurements.